Take a look at what we were doing at the Fitzhugh St Church in 1955. Father Angelo Maggos explores the purpose and symbolism behind the Greek Orthodox Church's various use of candles. The children of the Annunciation Greek Orthodox Church of Rochester celebrate the Sunday of Orthodoxy to commemorate the first day of Lent. 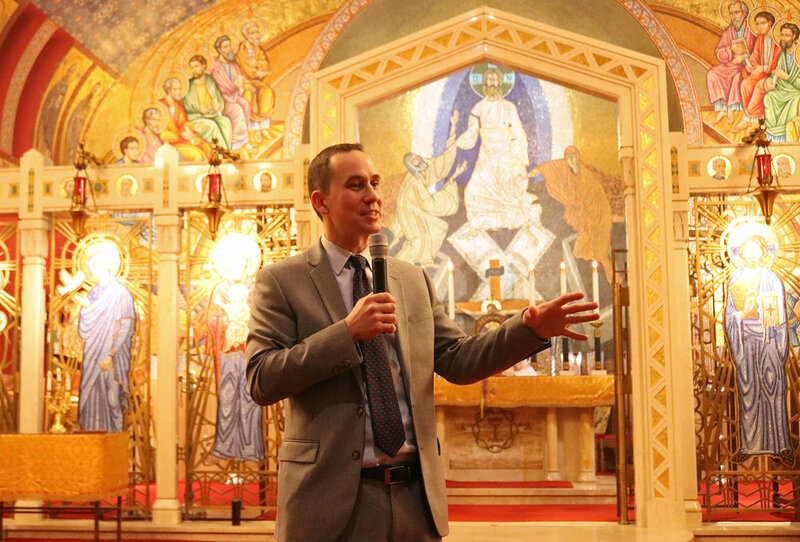 Pastor Stephen Cady, the senior minister at Asbury First United Methodist Church, visits Annunciation Greek Orthodox Church to speak on Lenten and Paschal Traditions of the Protestant Church. Pastor Stephen received his PhD in Practical Theology from Princeton Theological Seminary and is uniquely qualified to offer us an informed insight about how other Christian Traditions celebrate this most important season of the Christian Church. The children of the Annunciation Greek Orthodox Church of Rochester prepare the Koliva for the Saturday of Souls, the religious day to commemorate those who have passed on. What is the proper way to dispose of Holy or Blessed items at home such as Palm Sunday crosses or old Holy Water? How do you clean a holy cloth? The question of how to fast generates quite a bit of discussion and confusion, especially since there are so many different opinions from different priests on the rules of fasting. Life in today’s world can make keeping the fast difficult for many of us. To help clarify this, I offered 3 levels of fasting that hopefully will provide each of us with a way to use the Lenten period to prepare for the joyous Resurrection of our Lord and Savior. I base these 3 levels on the 3 pillars of a proper approach to Great Lent: Prayer, Fasting, and Giving Alms. LEVEL 1 – This is most strict and reflects a strict adherence to the established rules of fasting. · No partaking of any animal products (animals being defined as having blood), so this includes most fish. · No partaking of any food derived from animals, such as eggs, cheese, milk, etc. · No partaking of alcoholic beverages and olive oil; however, olive oil and wine ARE allowed on Saturday and Sunday. This type of fast is advisable only for those whose lifestyle allows for such a rigid restriction of food. Additionally, just as one cannot immediately participate in a 20 mile marathon without adequate training, this type of fast also requires “training” to be able to endure this level of strictness. This type of fasting is inadvisable for those with demanding jobs, those undergoing stressful situations, the elderly or those taking life-saving medications. LEVEL 2 – Not as strict as level one, this level focuses more on portion control rather than adherence to strict fasting rules. During Lent the Holy Fathers tell us to limit our intake of food in an effort to practice the discipline of the body and avoid the vice of gluttony. By leaving the table a bit hungry we have a constant and very real reminder of where our focus should be – on God. This was the primary reason for the institution of the Pre-Sanctified Liturgy, which was to offer the faithful the sustenance of Holy Communion to help them keep up their strength and perseverance during the Lenten period. So, for example, instead of having two or three pieces of large chicken breasts, have just one. This type of fast is more appropriate for those with demanding jobs or stressful situations since it offers them the nutrition they need but are still able to observe the essence of the Lenten fast. LEVEL 3 – Not everyone’s situation is conducive to keeping a strict fast. This includes not only those with demanding situations but also those new to the practice of fasting. At this level the focus is primarily on the other two aspects of Lent: prayer and the giving of alms or charity. To the extent possible, try to keep the fast on Wednesday and Friday at either a level 1 or level 2, but put increased effort on prayer and diligently explore ways to donate your time and talent to works of charity. This could include volunteering at activities such as a soup kitchen, food pantry or lending closet. If you are taking medication or have dietary requirements from your doctor then you have permission to take the medication or eat (within reason) what is required before receiving Holy Communion. Holy Communion is not to be viewed as something you take in place of medication. The Church works in concert with science for the benefit of both our health and our salvation. All of us are capable of keeping the intent of Great Lent through one of these levels and I encourage us all to devote ourselves to this most important time of the Church year, the preparation to meet our Lord at the culmination of our salvation – His glorious Resurrection. Please don’t hesitate to call me or email me with any questions to help guide you in getting the most out of Lent and Holy Week. Can You Get Sick from Shared Greek Orthodox Communion? Can you get sick or catch a disease from the communal serving of Greek Orthodox Communion? Students from the Annunciation Greek Orthodox Church surprise officers at Rochester NYPD and thank them for their service with cards & cookies. Special thanks to Lt. M. Cotsworth and his gracious 3rd platoon Officers! Holiday fun at the Annunciation Greek Orthodox Church of Rochester. It may smell great and add to the ambiance, but what is the real reason that priests censer in churches? Greek Orthodox 101: How Is Communion Prepared? Every week, people around the world receive Holy Communion as a sacred part of the Orthodox faith, but how is it prepared? What are the steps and rituals that must be performed to transfigure the wine and bread into holiness? What happens if a fly lands in the Communion wine? All those answers and more await in Part Two of our multi-part series exploring the secrets and history behind why the Greek Orthodox Church does things the way they do. Greek Orthodox 101: It's All Greek To Us! Part One of our multi-part series exploring the secrets and history behind why the Greek Orthodox Church does things the way they do. Why does everyone kiss the priest's hand? Does the side of the church you sit in have any special meaning? What happens if a fly lands in the Communion wine?